Set within 2.2 km of Levi's Stadium and 2.7 km of California's Great America in Santa Clara Global Luxury Suites at Agnew Road features accommodation with free WiFi seating area and flat-screen TV. The units come with a kitchen featuring coffee machine and a dining area a living room with a sofa and a private bathroom with free toiletries and bath or shower. Barbecue facilities are at guests' disposal. Intel Museum is 1.4 km from Global Luxury Suites at Agnew Road while 49ers Museum is 2.1 km from the property. 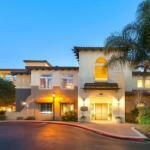 The nearest airport is Mineta San Jose International Airport 4 km from the property.